Music library is a CDDB-enabled comprehensive music database manager designed for MP3 and record collectors. Music Library lets you catalog any music files or media such as MP3s, WAVs, OGGs, WMAs,APE,FLAC, audio CD's, vinyl's and cassettes etc. with a MS Access database. You can use it to lookup ID3 tag information/lyrics for MP3's or download detailed CD information from CDDB. Music Library supports all windows standard file operations. ...... Music Library supports all windows standard file operations, such as copy, move, delete files/folders. Music Library can even create folders and move files base on a template and ID3 tags. For record collectors, you can use it to keep track of your collections, besides the information retrieved from CDDB, you can also add personal notes, loan status, insurance, location, cost, and more. Music Library provides an easy to use Explorer-style interface, Music Library allows you to group, sort and view entries by artist, composer, album, genre, location and year. 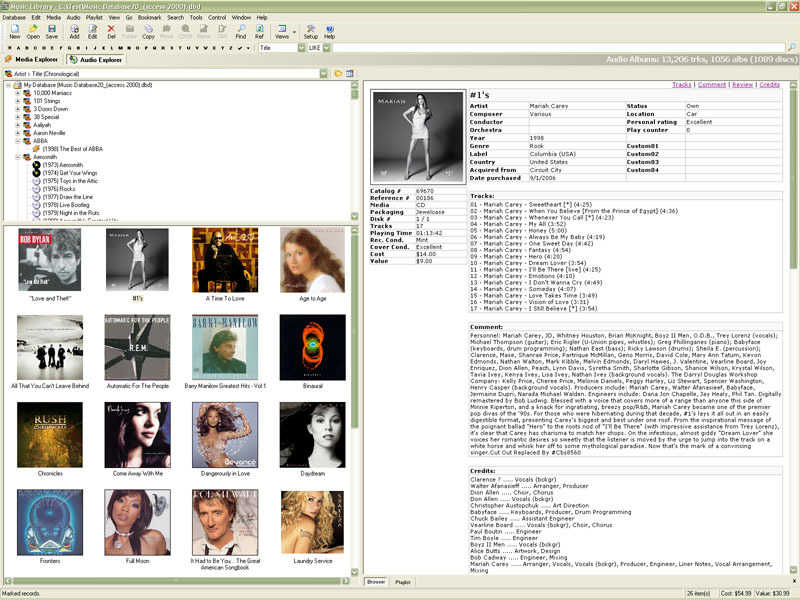 Other features include SQL support, a standalone CD player that can automatically display detail track information, lyrics and cover arts, lyrics database manager, import/export/compare database, powerful search functions, professional style report creator, MP3-Audio CD composer, cover art viewer and Winamp front end control. Qweas is providing links to Music Library 2.0.957 as a courtesy, and makes no representations regarding Music Library or any other applications or any information related thereto. Any questions, complaints or claims regarding this application Music Library 2.0.957 must be directed to the appropriate software vendor. You may click the publisher link of Music Library on the top of this page to get more details about the vendor.